Start a good relationship with your muscles by giving back to them in the form of a massage! The more you do for them, the more they’ll do for you. With the Addaday full body massage kit you’ll have the ability to treat your body right. Get precise and complete with the 2x roller, relax and roll with the Hexi and get micro pinpoint relief with the footy. The skin surface technology on the blue and black gear helps grab at the fascia and adds a soft touch. The type X2 glides easily over the body and enables you to use different grips and hand positions to find the right massage techniques for you. 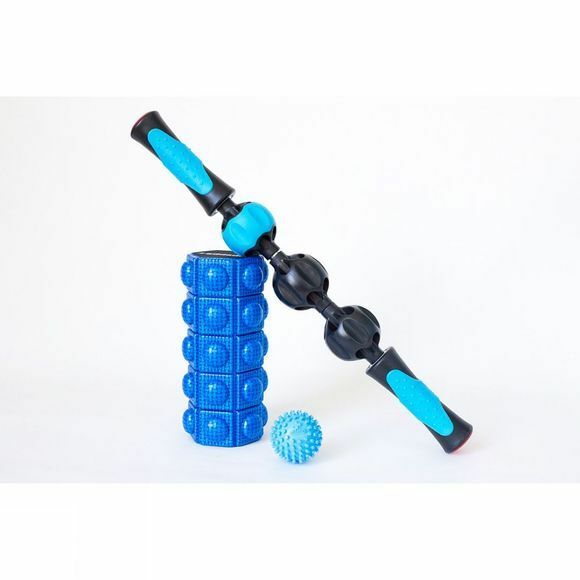 The Hexi is a versatile mini foam roller featuring a padded cushioning that adds a soft touch and a 6-sided design which connects to the fascia with precision. The Hexi works great for different uses i.e. to roll your feet, place under your hamstring on your chair or behind your back on the couch. The Footy will help you get that plantar relief you are craving for. After a good calf massage with either the X2 or Hexi, use the footy to help relax your plantar fascia even more.